Do you love Cthulhu? Do you love Tomagotchi? Oh boy, do I have a treat for you! 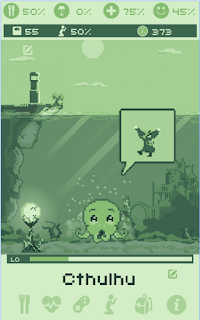 Cthulhu Virtual Pet does exactly what you think it would. It allows you to raise your own adorable eldritch horror through means all too familiar to children of the 90's. The idea is to raise a happy and healthy Old One through regular baths (despite living in the ocean), feeding him all manners of organisms, and by plaguing humanity with the priest of R'yleh. To assist with this are four meters that must be kept up: food, sleep, health, and happiness. There are a variety of activities to increase each. Aside from the game itself, there are several mini-games available. They range from a Flappy Bird knockoff to a bridge builder and several others based on simple tapping. Unlike the main game, these mini-games are frustratingly difficult. CVP is a very slow moving game. You'll only need to check in on the little guy a few times a day to keep him happy and it will take days for him to grow. Beyond that, some of the controls and icons are a bit mysterious and not so very intuitive. Additionally, there are several sections that say more features are coming soon. As of this writing, the game was last updated on 03/30/2016, so we'll see if the additional content does come around. Finally, like many free mobile games, this one is supported by ads. However, they can be turned off by purchasing the ad-free version of the game for $1 within the app itself. I'd say it's definitely worth it as the ads distract from the nostalgic charm of the game. 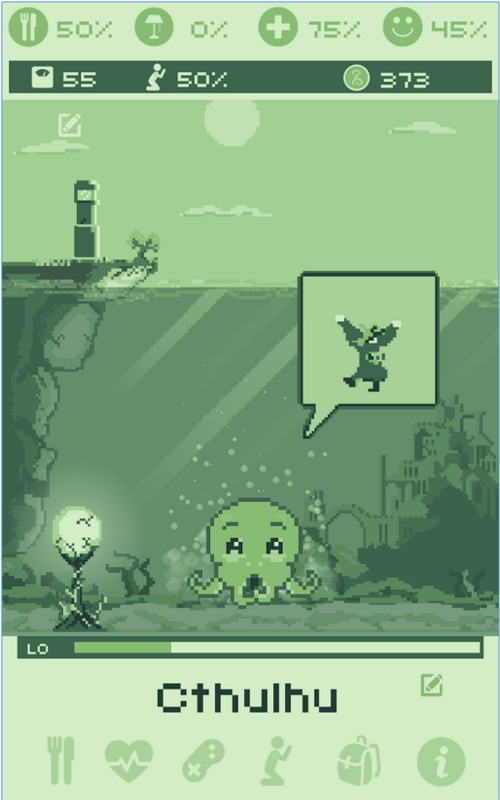 If you're a fan of Lovecraft or you like digital pets, Cthulhu Virtual Pet is definitely worth a try.